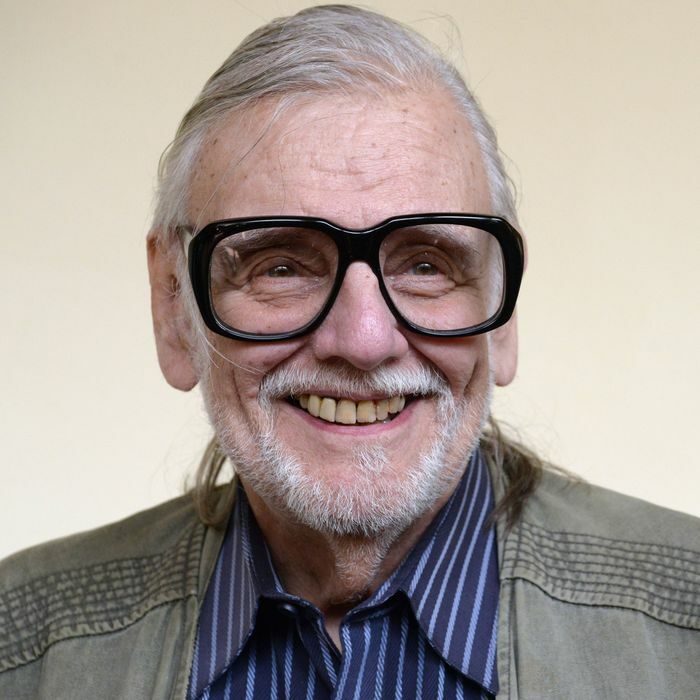 How good it would be to write an appreciation for director George A. Romero — who died of cancer Sunday at the untimely age of 77 — without invoking a certain word that begins with Z. For one thing, the word is misleading. For another, Romero’s legacy is so much more far-reaching. As an independent American regional filmmaker (based in Pittsburgh) and a genius at distilling social and psychological traumas into lacerating drama, he set a standard that genre directors have been laboring to live up to for half a century. Here comes the Z-word, I guess. But with this caveat: Night of the Living Dead isn’t a zombie film. Zombies were Haitian slaves of folklore (and possibly fact), rendered compliant by unscrupulous plantation owners or mad scientists in films like White Zombie and the Jacques Tourneur–Val Lewton I Walked With a Zombie. What Romero gives us is ghouls that feed on human flesh and spread their contagion like a virus, a plague. He eventually began to use the word, but only because others used the label and it took. I’m going to avoid it, so there. Night was a movie made for nothing that started small at drive-ins and grindhouses and seeped into the culture like blood into a rug. The year was 1968, the height of 20th-century American social upheaval. The Vietnam War and race riots were on TV every day — it seemed like the revenge of the ugly side of human nature that all those traumatized World War II vets had tried to keep their families safe from. Romero piped all the social and racial tensions of that era into the film, which opens with a flag fluttering in a lonely cemetery and ends with images that evoke a lynching. The hero (Duane Jones) is black — unprecedented at the time in a horror movie. He’s one of seven trapped in a farmhouse, boarding up windows while ghouls amass outside. Authority has collapsed, rifle-toting rednecks roam the countryside, and the nuclear family is imploding. Brother comes incestuously after sister. A little girl feasts on her mommy’s flesh. Romero’s ideas have been cannibalized in movies and TV. They’ve been parodied, even domesticated. And there has been far grislier gore, some in Romero’s own films, created by Tom Savini — who worked from memories as a medic in Vietnam. But the blood in Night of the Living Dead is still shocking: It shines like oil in black-and-white. Romero’s canted angles intensify the claustrophobia. He mixes jittery documentary techniques with montage that would have done Eisenstein proud — though Eisenstein’s glasses-shattering bullet in an eye has escalated into ghouls snacking on coils of viscera after the movie’s beautiful young couple is incinerated in a car fire. One of the great injustices is that Romero barely made a dime from his masterpiece. There was financial chicanery, and by the time the video era came around, the film was in the public domain. He had a flop with The Crazies (1973), which actually holds up: Its vision of a white-suited paramilitary unit moving through a forest, mowing down people rendered insane by a virus is hard to forget. The cost of living was low in the Pittsburgh area, where he stayed all his life after graduating from Carnegie Mellon. But the bitterness of losing out on the Night of the Living Dead mother lode never fully left him. The next Dead film, Day of the Dead (1985), was greeted with disappointment on its release. The bottom had dropped out of the budget before shooting, and Romero had been forced to scale his vision down. But the movie looks better with each passing year. Romero has successfully steered the saga into the ’80s, with its overweening military and a mad scientist who uses ghouls for hideous experiments, hoping to turn them into domestic servants (among other things). Once again, Romero was setting a sociopolitical agenda for the horror genre. He would continue to do that with later Dead movies. Land of the Dead (2005) was the first with name actors and is nothing less than a portrait of income inequality. Left to their own devices in deserted towns, the ghouls struggle to form social circles, and the villain is the super-capitalist (Dennis Hopper) who walls off wealthy white people in a high-rise condominium, keeping the underclass at bay. It’s more formulaic than its predecessors, but the idea of ghouls evolving toward humanity, and humans — indolent in their mall-like high-rise — toward ghouldom is more potent than in the current Planet of the Apes series, which dramatizes the same idea without satire. The final two Dead films, Diary of the Dead (2007) and Survival of the Dead (2009) are weak tea, but at least the former, a satire of first-person filmmaking and internet dependence, has enough social commentary (and splatter) to acidulate the brew. And the overriding theme of the series remained constant. Romero was certainly interested in the ghouls as walking sacks of blood and innards. But his true monsters were always humans. Romero made a number of non-Dead cult movies. His self-consciously Arthurian motorcycle epic, Knightriders (1981), has its partisans, but I gave up on it after two long hours. (Give me credit: I lasted ten times longer than Maslin did at Dawn.) He had a bona fide hit in his comic-book collaboration with Stephen King, Creepshow (1982), which I found mostly inert. Romero’s gift is for montage, not goofy composition, and only a sadistic scene in which a cuckolded husband buries his wife and her lover on a beach up to their necks as the tide comes in has any punch. But Monkey Shines (1988) is a dandy B-thriller in which a trained monkey becomes the servant and then functional id of a bitter quadriplegic. Scarier than the monkey, though, is the hero’s mom, played by Joyce Van Patten. The creature is essentially his vehicle of liberation from this repressive harridan matriarch, though it gets out of control and goes after people he cares about — as id manifestations tend to do. The movie is great fun, but it flopped, miserably. Romero made one non-Dead masterpiece, which is perhaps his most grueling film. Martin (1978) is the story of a young man who believes he’s a vampire and murders mostly women (with a razor) in his search for blood. What makes the movie so difficult is the boy’s naked longing for contact: It’s as if he feels he can never really know a woman unless he ingests her. In part, it’s his family that has made him what he is: He lives with his elderly uncle, a religious fanatic who rails against his demonic impulses without comprehending what’s behind them. Martin has a tortured pace, closer to an art film than Romero’s horror pictures. Perhaps that’s because it’s a portrait not of a vampire, but of someone longing to be one — an idea turned cartoonish in the Nicolas Cage black comedy, Vampire’s Kiss. Martin cuts so much deeper. Romero lived to see his impact on the culture, and even to see a few amazing works that acknowledged the momentousness of his influence: Edgar Wright’s satirical Shaun of the Dead and Max Brooks’s panoramic novel World War Z. (The latter was made into a film that has little connection to its source.) Romero was honored in every way but financial. Although the Z-word was mainstreamed, Romero’s work remained too prickly and personal and his vision too independent for studio bosses to throw money at him. He was planning another Dead movie when cancer suddenly chewed him up, and I’d like to think that this one would have shown the way forward — that he would have countered the persistent nihilism at the root of most dystopian bloodbaths. The best way to remember him, I think, is not as the man who made the most seminal of all horror movies, but as the filmmaker who captured the dark side of the 1960s the most indelibly. George Romero belongs not in the company of splattermeisters, but of visionary satirists. He taught us what genre can do — and we’re still learning from him.